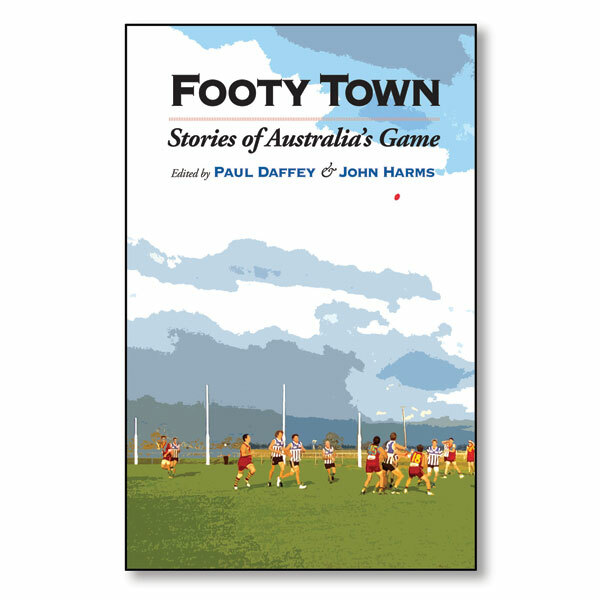 Footy Town is a newly-published collection of football yarns from around the nation; stories which celebrate footy at its most local: from New Norfolk to the Tiwi Islands, from Rockhampton to Kalgoorlie, from Edwardstown to Fitzroy, and all the way to Mangoplah Cookardinia United. The book is published by Malarkey Publications, the team behind the annual Footy Almanacs. Scoreboard Pressure’s founding editors each have a story in Footy Town. In 1988 I was on the Subiaco Oval watching the presentations after Subiaco had defeated Claremont in the WAFL grand final when it hit me like a stray footy. Subiaco’s Mick Lee was being presented with the Simpson Medal for best on ground. Here was yet another footballer from Western Australia’s Goldfields making his mark in the game. As Lee bowed his head to accept his medal I decided to write a book about football on the Goldfields. I grew up in the Goldfields town of Boulder. It’s so close to its twin city that the place is now called Kalgoorlie-Boulder. Visitors to the Goldfields are astounded by the number of hotels – there are still about thirty, which is not bad for an area with a population of 30,000. The row of brothels on Hay Street, almost in the centre of Kalgoorlie, says something about the cavalier character of the town. Recently when reading a history of prostitution in the Goldfields – The Scarlet Mile by Elaine McKewon – I discovered that a Japanese brothel had existed two doors up from my family home in Richardson Street. I grew up watching Goldfields footy and hearing stories about it. Good stories, too. Goldfields football has a remarkable history. I contributed to that history by kicking the winning goal in a grand final. My son needs to clock up more learner-driver hours. I want to check out some scoreboards. We open a country road directory, looking for towns and townships that have an oval. We don’t know if these places still have footy clubs but if they have an oval they might have a scoreboard. And that’s good enough for me. We slap the plastic ‘L’ plates on the front and rear windows of the Tarago, fill in Jesse’s learner-driver logbook (time, odometer reading, road conditions, etc) and head out of the city, through the western suburbs and onto the Western Freeway. We have mapped out a rough circle that will take in a half-a-dozen towns and four or five hours of driving. Jesse has 77 hours and 40 minutes of the required 120 hours before being eligible to go for his licence. I park myself in the passenger seat, relatively relaxed. Jesse is a careful, composed learner-driver. We have sandwiches, drinks, maps, petrol, and camera. We have each other. Our thanks to the editors, Paul Daffey and John Harms, for inviting us to be part of Footy Town.